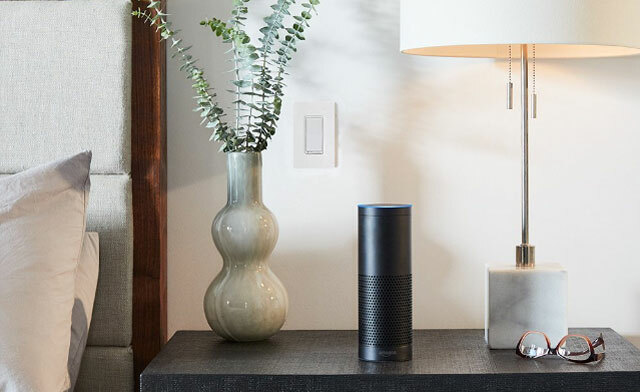 It may be time to upgrade your smart home setup with one of Amazon's three new Echo devices. The latest Echoes are solid upgrades over their older counterparts, with better sound and better smart home integration — so if you were on the fence about buying an Echo, now's the time to shop. Check out all the details on the new lineup below. The Echo and its new siblings are still, essentially, the same devices. 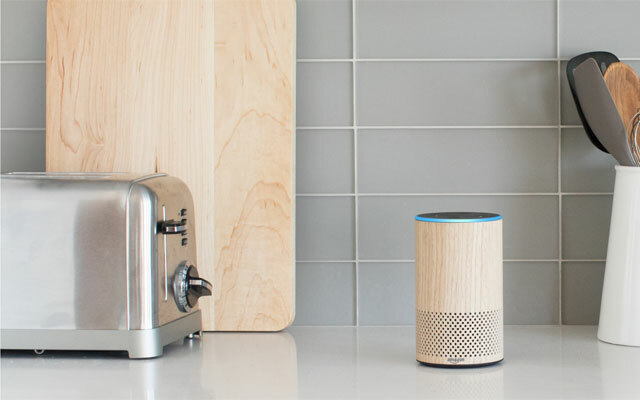 They're voice-controlled smart speakers that play music, make voice calls, answer questions, and perform thousands of other Alexa-enabled tasks, all hands-free. But the Echo, which was released in 2014, was in need of a hardware upgrade. The second generation Echo is smaller but manages to pack in much better sound with Dolby sound processing as well as a dedicated woofer and tweeter. It also has a new look: it's a bit smaller, with a fabric or faux wood covering (though you can get it in a sleek silver finish, too) that has a homier look than the original. But it's the price that really impresses us: the second generation Echo costs just $99, which makes it an incredible value compared to the $179 price tag of the original Echo. And if you'd like a set of Echoes to link together for whole-home sound, right now you can buy three for just $249. (To take advantage of the limited-time offer, you'll need to place the 3 Echos in your cart and use the code ECHO3PACK.) 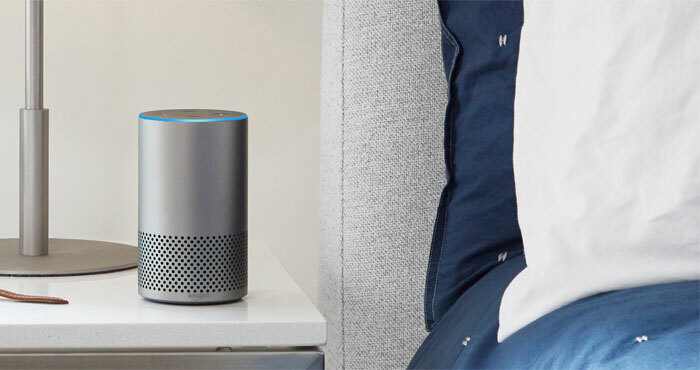 You can order your Echo now, and it will ship October 31. While Amazon's Alexa devices already worked with select smart home devices, the new Echo Plus has a smart home hub built- in. That means you can run many of your smart home gadgets from your Echo — Amazon already has over 100 smart home partners — instead of needing different hubs for different devices. To make this work, it supports ZigBee, a wireless language that's used by many smart home devices. Any ZigBee devices you already have should work seamlessly with your Echo Plus. And if you don't have a smart home just yet, the Echo Plus comes with a Philips Hue smart light to help you get started (at least while supplies last). On the outside, the Echo Plus is nearly a twin to the original Echo: it's a tall, slim cylinder with a sleek finish in black, white or silver. And, like its smaller Echo sibling, the Echo Plus has upgraded sound, with Dolby sound processing and an all-new speaker architecture for music that fills the whole room. And despite all of the updated tech inside, the Echo Plus still costs less than the first-generation Echo, selling for just $149. You can order your Echo Plus now, and it will ship October 31. 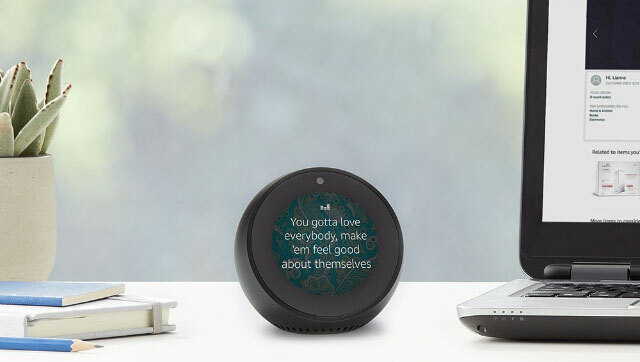 In addition to the standard Echo features, this petite model has a round, 2.5-inch screen for playing anything from Amazon Video and a built-in camera for making video calls. It's similar to the Echo Show, which has a 7" screen, but the Spot's small size is just right for a lot of things. Put it on a bedside table for a smart alarm clock, set it beside the crib for a baby monitor, or simply leave it on your desk for easy access to your reminders and notifications. You can order your Echo Spot now for $129, and it will ship December 19 — just in time for the holidays. But if the Echo doesn't catch your eye (or your ear), there's also a new Alexa-enabled Fire TV with 4K and HDR support. Beyond offering great picture quality — as long as you have a television and media source in 4K HDR — the latest Fire TV has a fantastic price tag that makes it one of the cheapest ways to get 4K streaming on your television. If your home media center is in need of an upgrade, it's a gadget you definitely want to check out. At $69, the latest generation Fire TV is the same cost as the Chromecast Ultra. Both gadgets support 4K HDR, but the Fire TV adds Dolby Atmos sound to the package and comes with a remote that can be voice controlled with Alexa. That gives the Fire TV a premium set of features for a budget-friendly cost. But beyond its upgraded features, the Fire TV has a brand new look: it's no longer a set-top box, but instead, a small dongle that plugs into the back of your television. That makes it nearly as portable as the tiny Fire TV Stick, but with top-notch picture quality. You can order your Fire TV now, and it will ship on October 25. Is there anything special that needs to be done to take advantage of the 3 Echos for $249 mentioned in the article? I have tried putting 3 in my Amazon cart but the best price I see is $99 each. If you place three Echo devices in your cart and use the code ECHO3PACK, you will receive $50 off your order. Thanks for flagging this. I’m updating the story as well. Yes, No doubt Echo Plus is a good smart device with its amazing features. Amazon new devices Echo look and Echo Spot is coming to market at the end of this year at affordable prices.